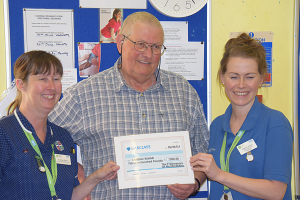 On Friday 5th June 2015 Hertfordshire Freemason, E Comp Keith Townsend (Ravenscroft Chapter 2331) presented a cheque for £1300.00 to Luton & Dunstable Hospital Trust as a token of his thanks for their dedication in restoring him to health after two heart attacks. Since his second heart attack in 2014 Keith has been attending the Cardiac Rehabilitation unit at the L&D which works to build heart strength following cardiac arrest and raise awareness about heart health. One staff member asked him to buy some raffle tickets explaining that the proceeds were to raise money to buy equipment such as heart rate monitors and models of hearts so Keith decided to raise money through various Masonic charity funds. The Hertfordshire Provincial Royal Arch, Mark & Knights Templar and Icknield & Ravenscroft Chapters all contributed, and Keith himself donated a new music centre. Sister Amanda Rankin (left) said that she was delighted with the donation and it would make a real difference to those who attended the unit. The Cardiac department has grown significantly of the last 30 years, from one consultant in 1985 to 6 today and the number of patients requiring their services has increased enormously as lifestyles and poor diet has led to more incidents of heart disease.